Successfully Added All in One HDD Docking Station - IDE, SATA, USB 3.0, Indicator Lights, to your Shopping Cart. This USB 3 HDD docking station lets you plug in 2.5 Inch and 3.5 Inch IDE or SATA Hard disc drives and allows for up to 5Gbps transfer speeds. With its one button copy function for USB and the HDD caddy can also be used as a 2-port USB hub that lets you quickly and easily transfer and share files between multiple devices. This HDD docking station is the perfect tool for you to transfer files between memory or HDD to your PC. Support for all major versions of Windows as well as Linux and Mac OS support allow it to be used on most platforms and provides an all in one solution for anyone working with a lot of internal HDD and storage solutions. 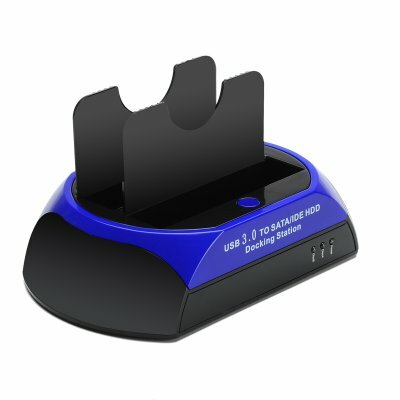 This All in one HDD docking station comes with a 12 months warranty, brought to you by the leader in electronic devices as well as wholesale computer accessories..